The Interreg V-B Adriatic-Ionian programme, better known as ADRION, is a European transnational programme that works within the familiy of INTERREG, one of the key instruments of the European Union (EU) supporting cooperation across borders through project funding. ADRION promotes cooperation and solidarity between eight Partner States within the Adriatic and Ionian region, including Albania, Bosnia and Herzegovina, Croatia, Greece, Italy, Montenegro, Serbia and Slovenia. ADRION acts as a policy driver and governance innovator, giving support to European integration among its Partner States as well as enhancing economic, social and territorial cohesion in the Adriatic and Ionian region. 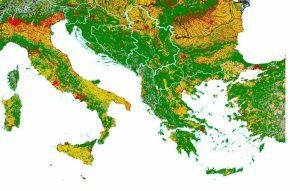 The Adriatic and Ionian region is a place of considerable differences. On the one hand, it is home to some highly competitive regions, which are global leaders in research and development and have excellent research facilities and systems of product quality certification. Its rich, natural and cultural heritage makes the Adriatic and Ionian region one of the most attractive tourism destinations in the world. Situated at the crossroads between the Mediterranean, Eastern Europe and Asia, it has a strategic geographical location and enormous potential for growth in the transport system. On the other, it has also a large number of territories with poor economic performance, limited research capacities, and low manufacturing productivity. Some areas are affected by increased household waste production and low air quality. Moreover, the transport links among Partner States, as well as the transport connections between coastal and inland areas suffer from imbalances on the two coasts of the seas. The remaining MEUR 18,8 are Partner States’ contribution (national contribution). In general, ADRION grants subsidies to beneficiaries through calls for project proposals. When a call for proposals is launched, interested applicants shall submit their project proposals in accordance with programme requirements and application form. The submitted project proposals are assessed according to the eligibility and quality criteria. These criteria are defined with the aim to deliver the best results for the Adriatic and Ionian region, while also addressing identified challenges and development needs in an integrated manner. ADRION is ruled by a Cooperation Programme, drafted by an ad hoc task force composed by representatives from each Partner State. The cooperation programme is structured in priority axes and related expected outputs and results, defined following a careful examination of the needs and opportunities of the Adriatic and Ionian region. The main findings were provided in the Territorial Analysis document, which also included a SWOT analysis. Further two documents contributed to the development of the cooperation programme: the ex-ante evaluation and the strategic environmental assessment. With reference to the European Territorial Cooperation geography, ADRION cooperation programme was drafted also taking into consideration the lessons learnt in the previous programming period 2007-2013 by South East Europe Transnational Programme and IPA Adriatic Cross-Border Programme. ADRION covers eight Partner States, of which four are EU Member States (Croatia, Greece, Italy and Slovenia), three are candidate countries (Albania, Montenegro, Serbia) and one is a potential candidate country (Bosnia and Herzegovina). The geographical area of each Partner State covers its national territory except for Italy, where programme area covers 12 regions and 2 provinces.